For those of you just tuning it, it was a year ago today that I received my bedrest sentence. I spent a total of 123 days on bedrest, and seven weeks of that time was in the hospital. If you are interested in my bedrest journey then you can start at the beginning of this blog to read all about it. We were very blessed to have had a happy ending at the end of this arduous adventure, and I can attest now that it was only a tiny blip on the radar of life. There were days when it seemed like the time wasn't moving at all, but here we are 8 months later with a happy, healthy, beautiful baby girl. So, keep on keeping on and may God bless you and your family if you are on a similar journey. For those faithful readers who were along with me for the journey, thank you for all of your kind words and support through out this ordeal. I was very blessed to have such a wonderful, supportive family and network of friends both locally and online. If it weren't for the flood of emails, cards, blog comments, and phone calls, I would have had a totally different experience. We have had a wacky, fun time trying to adjust to being a family of four, and we are now thriving and well. If you care to continue following our story, then you can find it here on my new blog. 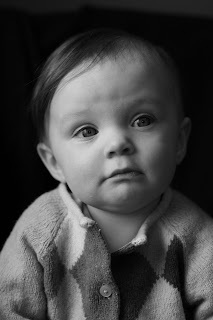 Lastly, I will leave you with a recent photograph of Dylan Grace at 7 1/2 months old. I'm writing an article for Parents magazine, and I need to get some stories from real moms who were prescribed bedrest. I'm looking to find out what you did to pass the time and entertain yourself while sentenced to bed! If you're interested in contributing, email me at janna (dot) oberdorf (at) meredith.com. Thanks, I'd love to hear from you! thanks for your blog. i've been searching for comments, experiences, and things you did to pass the time. i'm so glad you have a beautiful, healthy happy ending. your son is juicy and gorgeous-congrats! might , perhaps very interested to know how one can collect a huge starting capital . Wishes your valentine day to be joyful! Good dispatch and this mail helped me alot in my college assignement. Thanks you seeking your information. "Green Smoke offers quality Electronic cigarettes with spendable cartridges that compose of the highest smoke volume in the industry. With a variety of flavors and nicotine levels, Green Smoke's™ patented product offers convenience and performance that is unmatched. G Smoke products have been independently tested for safety." The newly introduced iPad of Apple is awesome, uncommon and incredible computing device. It is super high quality, super responsive and super processor. This technology is most advanced version ever developed. Apple iPad has great browsing speed as you can quickly flick through multiple pages tapping each on a block. And unlike the iPhone you now have complete webpages without much effort. Your thought processing is wonderful. The way you tell the thing is awesome. You are really a master. Great Blog!! That was amazing. I was really happy to visit this awesome uniqe and good updated site now. I needed to thank you for this fantastic posts! Do you play poker on laptop computer these days ?